HomeIn The News24Hr HomeCare Named Number 81 on the Los Angeles Business Journal Fastest Growing Private Companies List for the Sixth Consecutive Year! 24Hr HomeCare Named Number 81 on the Los Angeles Business Journal Fastest Growing Private Companies List for the Sixth Consecutive Year! 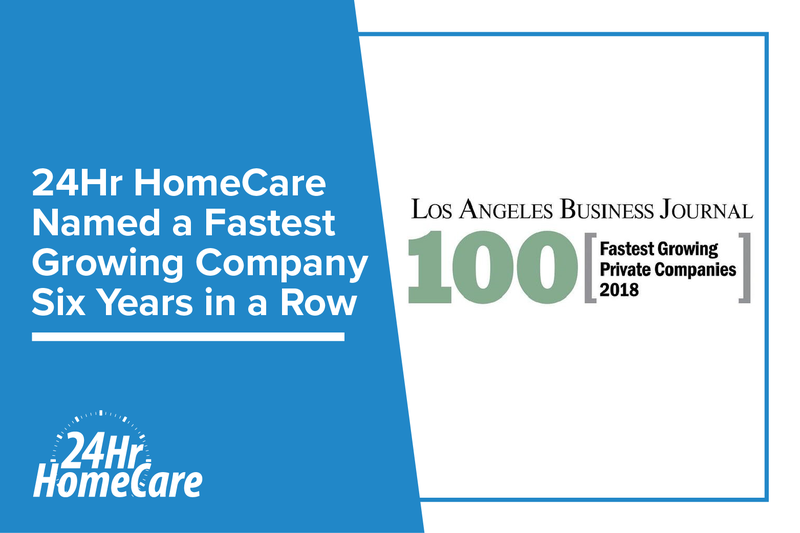 Los Angeles, CA – 24 Hour Home Care is elated to announce that they have been named number 81 on the Los Angeles Business Journal’s List of Fastest Growing Companies for the sixth consecutive year. This award comes on the heels of 24 Hour Home Care, who celebrated their 10th anniversary this past year, being named on Inc. 5000 list for a sixth consecutive year as well! To be given this prestigious award, the company in question must be headquartered in Los Angeles, CA and has to have displayed immense growth, innovation and expansion since their inauguration into the Los Angeles community. The companies that are given this award are innovators both in the community and in their trade. Since its inception in 2008, 24 Hour Home Care has expanded from one office in Torrance, CA to 16 offices throughout California, Arizona and Texas, with 8 offices serving Los Angeles county alone. 24 Hour Home Care has continued to modernize the home care industry by bringing new innovative programs to their clients and consumers. New programs, such as the Care Extenders program, a program focused on preventing hospital readmission in conjunction with Cedars-Sinai Hospital, have allowed 24 Hour Home Care to break into aspects of the industry that have traditionally been untouched.